Delicious seasonal produce is easy to come by this time of year, so it only makes sense to use as much as possible in your meals, snacks, and desserts. These family friendly recipes will make your summer healthier and more delicious! Blackberry Citrus Granola Bowl. Blackberries are a quintessential summer fruit, and pairing them with whichever citrus fruit you have on hand makes for great flavor on top of granola and and almond, soy, or dairy milk. Basil Pesto Pasta. Pesto is an excellent alternative to heavy pasta sauces. Basil grows best in the summertime, and is delicious when minced with olive oil, parmesan, pine nuts, and garlic. Spanish Chicken and Rice. This take on arroz con pollo can be made by sauteeing chicken with onions, garlic, and olive oil and mixing in red and green bell peppers, which grow well in the summer. Sprinkle in some paprika and serve on top of yellow rice. Grilled Peaches. This dessert is deceptively simple. 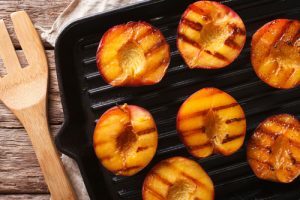 Lay a few peach slices on your backyard grill, and let them grill until you see clear grill marks. Drizzle with balsamic vinegar and serve with ice cream or whipping cream. Caprese Salad. 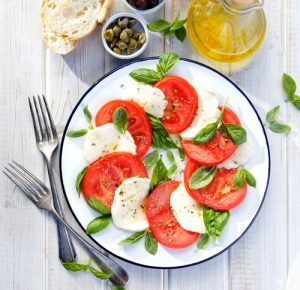 This is an easy summer salad that combines slices of fresh tomatoes topped with mozzarella cheese and basil and drizzled with olive oil, salt, and pepper. Pasta with Cherry Tomatoes and Basil. Looking for the flavors of a caprese salad in pasta form? Sautee cherry tomatoes in olive oil and top with julienned basil, salt, and pepper, and toss with the pasta of your choice. Watermelon Lemon Popsicles. This is a great choice for kids on a hot day. Load chunks of watermelon and a dash of lemon juice into your blender, and pour the mixture into popsicle molds. Pickled Cucumber Salad. Cucumbers are at their best in the summer, and marinating them in vinegar with salt and dill makes for a great snack or side. Lemon Asparagus Pasta Salad. Asparagus is a popular summer veggie, especially when grilled. Add it to a pasta salad along with lemon juice, rosemary, and a sprinkle of parmesan. Blueberry Mango Smoothie. Smoothies are a hit in the summertime, and this smoothie can be made by adding two cups of frozen blueberries and mango to your blender along with a half cup of yogurt, a tablespoon of honey, and two cups of coconut water. What are some of your family’s favorite summertime recipes that take advantage of fresh seasonal produce? Share your recipes with fellow parents in the comments section!